Satoshi ‘Sato’ Kikuchi, formerly of Tetsuya’s and Sean’s Kitchen, is delivering a new style of dining to the southern Australian city of Adelaide. His modern Japanese-led menu embraces contemporary Europe in dishes such as aubergine with miso, chilli, mushroom and indigenous Macadamia nuts; or scallops with oyster cream and bacon-infused purée with prawn crackers. A somewhat unexpected find on King William Street, Adelaide’s most grand boulevard, even less anticipated is that the restaurant is hidden on the first floor of heritage-listed, 115-year-old Electra House, the former home to Australia’s only Morse telegraph building. A $10-million renovation has seen the building re-open as a dining destination with the ground floor bar a hit with the inner city crowd. Upstairs though, there was no sense of arrival, so local architects Graham Charbonneau and David Bickmore of Studio-Gram were approached. ‘They wanted a total make over,’ says Charbonneau. 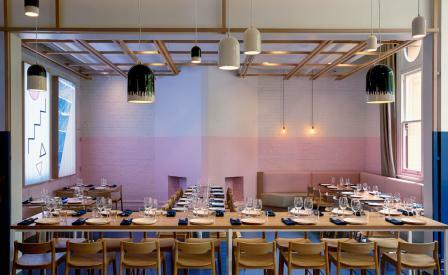 ‘And they wanted a big visual impact.’ The young firm’s playful personality is on display with pink walls and custom Electra House Blue, back-lit artwork, neon signage and – as Charbonneau puts it – Tasmanian oak ‘scaffolding’, which frames the room and accrues through to the shelving and wait stations. ‘Walk in here now and everything pops!’ says Level One manager Chad Hanson. It’s a design that provides a sense of kawaii fun and a place to indulge in some of Australia’s most accomplished Japanese dishes.